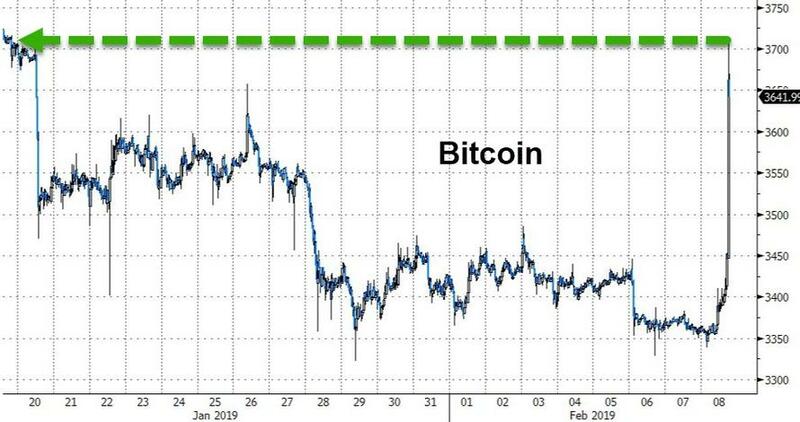 There is no clear catalyst for the sudden shock, but as The Independent reports, the latest rise follows news that bitcoin's hashrate – the amount of power its network consumes to process transactions and generate new units of cryptocurrency – is at its highest level since November 2018. This can be an indicator of subsequent price gains, though there are many factors that determine a cryptocurrency's value. However, as CoinTelegraph noted earlier in the week, JPMorgan’s Global Market Strategist Nikolaos Panigirtzoglou says that Bitcoin could make a resurgence on Wall Street, according to an article published by CNBC on Feb 6. Panigirtzoglou predicts that firms will show a renewed interest in cryptocurrencies as stability in the market grows and as Bitcoin’s underlying blockchain technology grows more important. He added that a Bitcoin’s resurgence could be years away, as regulators are a “bit slow to realize” the potential of the cryptocurrency. Of course there is always the possibility that panic in Venezuela is setting a bid under the market (as The Independent notes that Venezuelan bitcoin trading volumes reached a record this week).